In the planet of database technology, there are two main types of databases: SQL and NoSQL—or, relational databases and non-relational databases. The differences are mainly in how they’re built, the type of information they store and how they store it. Relational databases are structured like phone books that store phone numbers and addresses. Non-relational databases are document-oriented and distributed, like file folders that hold everything from a person’s address and phone number to their Facebook likes and online shopping preferences. We call them SQL and NoSQL. The records (data) would be stored in ‘tables’ with fixed-length records, unlike the free-form list of linked records in an IDS (Integrated Data Store) and IMS (Information Management System). The nuances and benefits of RDBMSs had a wide impact, resulting in buy-in from different vendors and setting the stage for an era of the database wars. Note: NoSQL forecasts a US$ 4.2 billion revenue by 2020. NoSQL: On what parameters does it score high? Let’s compare the two types of databases on the following set of parameters. Architecture design runs well on a single machine. To handle larger volumes of operations, it is better to upgrade the machine with a faster processor or more memory. There is a limitation to the level of scaling. NoSQL databases are intended to run on clusters of comparatively low-specification servers. To handle more data, more servers need to be added to the cluster. These databases are calibrated to operate with full throttle even with low cost hardware. It’s a relatively cheaper approach to handle increased number of operations. Can handle high volumes of data. RDBMSs are high maintenance databases. 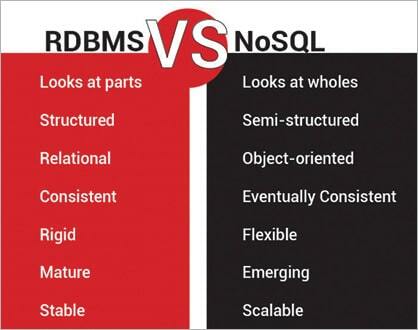 Maintaining high-end RDBMS systems is expensive and requires a trained workforce for database management. NoSQL databases are low maintenance databases. These databases require minimal management and they offer many features. These include automatic repair, easier data distribution and simpler data models. RDBMSs have a rigid data model. RDBMSs require data in a structured format as per a defined data model. As change management is a big headache in SQL with a strong dependency on primary/foreign keys, ad hoc data insertion becomes tougher. NoSQL databases are based on a no schema data model. A NoSQL database is schemaless; so data can be inserted into it with ease, even without any predefined schema. The format or data model can be changed anytime, without application disruption. RDBMSs use separate hardware for caching. The caching in a typical RDBMS requires separate infrastructure. As there are overheads, the logic of retrieval involves a little delay. NoSQL databases support caching in the system memory, which increases data output performance. Listed below are a few reasons for choosing an SQL database over a NoSQL one. You need to ensure ACID compliance (atomicity, consistency, isolation, durability): ACID compliance reduces anomalies and protects the integrity of your database by prescribing exactly how transactions interact with the database. Generally, NoSQL databases sacrifice ACID compliance for flexibility and processing speed, but for many e-commerce and financial applications, an ACID-compliant database remains the preferred option. Your data is structured and unchanging: If your business is not experiencing massive growth that would require more servers and you’re only working with data that’s consistent, then there may be no reason to use a system designed to support a variety of data types and high traffic volume. Given below are a few reasons you might choose a NoSQL database. Your business stores large volumes of data that often have little to no structure: A NoSQL database sets no limits on the types of data you can store together, and allows you to add different new types as your needs change. With document based databases, you can store data in one place without having to define what ‘types’ of data these are, in advance. A NoSQL database makes the most of cloud computing and storage: Cloud-based storage is an excellent cost-saving solution, but requires data to be easily spread across multiple servers to scale up. Using commodity (affordable, smaller) hardware on-site or in the cloud saves you the hassle of additional software, and NoSQL databases like Cassandra are designed to be scaled across multiple data centres out-of-the-box without a lot of headaches. Rapid development: If you’re developing within two-week, agile sprints, cranking out quick iterations, or need to make frequent updates to the data structure without a lot of downtime between versions, a relational database will slow you down. A NoSQL database doesn’t need to be prepped ahead of time.